Creativity is finding new ways to differentiate a client’s message and connect in memorable ways with important audiences. The ability to create a vision, and not just a single tactic. Creating something that makes you stop and think. It’s that something extra that makes a good campaign great. Whatever your definition, creativity should lead to effective and meaningful results for the client. Creativity is often thought of as everything “big,” meaning a big idea, a big integrated marketing campaign, or even big budgets. 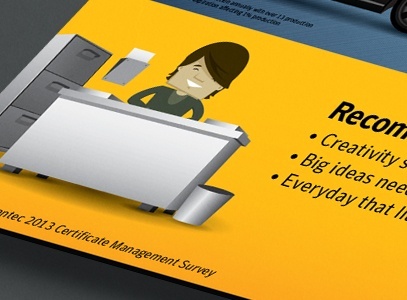 For example, a “big” idea came as an experiment we conducted for Symantec. The idea was to “lose” 50 smartphones in five different cities and then wait and see what would happen. Before we intentionally lost the devices we placed a collection of corporate and personal data on them, along with the ability to remotely monitor what happened to them once they were found. If you’re curious what happened, watch this video. This big idea delivered big results for the client with over 160 broadcast segments including the Today Show, and important business media like BusinessWeek and hundreds of other strategic media outlets and bloggers around the world. It’s no surprise that big ideas can be fun to execute and can yield tremendous results for a client. Creativity can reveal itself in the day-to-day tactical programs as well. One example is a creative daily method for monitoring the market landscape and responding to market trends and generating meaningful thought leadership with media on important topic areas. Responding to a crisis, or even the creativity used in a conversation with an influencer is so much harder to evaluate as “creative” than a knock your socks off award-winning campaign. The reality is both are important. Don’t make the mistake that everything creative has to be “big.” Find creative and innovative ways to better meet the client’s needs in the little everyday things that can make a difference.